This CellML version of the model runs in PCEnv and COR to produce graphs that are similar in shape but not in magnitude to the graphs in figure 3 of the published paper. This could possibly be due to a missing variable k55 in the equation for cdk1_c. The units have been checked and are consistent. ABSTRACT: The eukaryotic cell cycle is the repeated sequence of events that enable the division of a cell into two daughter cells. 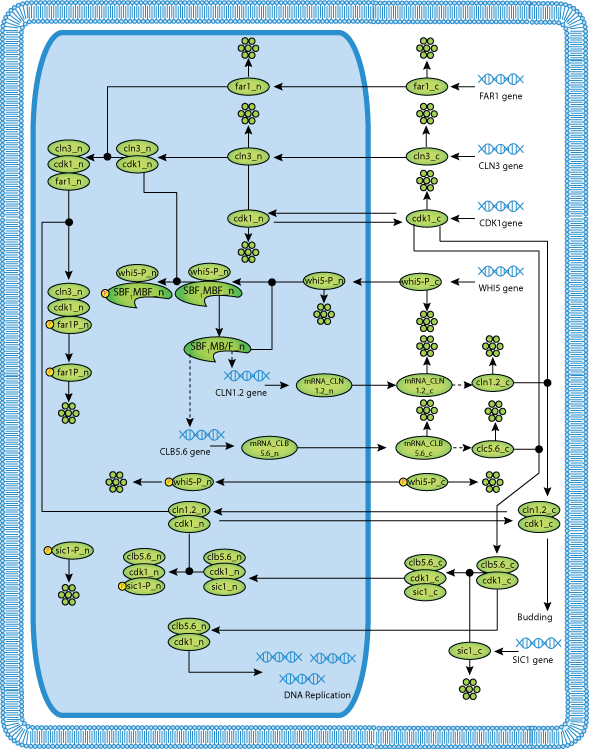 It is divided into four phases: G1, S, G2, and M. Passage through the cell cycle is strictly regulated by a molecular interaction network, which involves the periodic synthesis and destruction of cyclins that bind and activate cyclindependent kinases that are present in nonlimiting amounts. Cyclin-dependent kinase inhibitors contribute to cell cycle control. Budding yeast is an established model organism for cell cycle studies, and several mathematical models have been proposed for its cell cycle. An area of major relevance in cell cycle control is the G1 to S transition. In any given growth condition, it is characterized by the requirement of a specific, critical cell size, PS, to enter S phase. The molecular basis of this control is still under discussion. The authors report a mathematical model of the G1 to S network that newly takes into account nucleo/cytoplasmic localization, the role of the cyclin-dependent kinase Sic1 in facilitating nuclear import of its cognate Cdk1-Clb5, Whi5 control, and carbon source regulation of Sic1 and Sic1- containing complexes. The model was implemented by a set of ordinary differential equations that describe the temporal change of the concentration of the involved proteins and protein complexes. The model was tested by simulation in several genetic and nutritional setups and was found to be neatly consistent with experimental data. To estimate PS, the authors developed a hybrid model including a probabilistic component for firing of DNA replication origins. Sensitivity analysis of PS provides a novel relevant conclusion: PS is an emergent property of the G1 to S network that strongly depends on growth rate. Derived from workspace Barberis, Klipp, Vanoni, Alberghina, 2007 at changeset a0e3ce568d9e.